Audiologists specialise in communication science and disorders. Typically, these professionals work with patients who have problems with hearing, balance or other ear-related problems. Audiologists measure hearing loss and determine its cause. Once a diagnosis has been reached, they develop a treatment plan that takes into account the impact the disability is having on the patient. Audiologists are often members of a team of health professionals that includes speech pathologists, physical therapists, occupational therapists and physicians. manage patients with dual sensory loss (hearing and sight) or learning disabilities. Why did you choose this profession? I chose to become an audiologist because I wanted to help people and make a difference not only in their lives, but in their quality of life. What does an audiologist do? I assess and diagnose patients with hearing loss. I also provide rehabilitation through counselling and fitting of hearing aids. A large part of an audiologist’s work is to improve the communication in patients’ lives by assisting them with hearing better. Detection of hearing loss in newborn babies is another part of my work. What training did you undergo and where? I obtained a BSc in Audiology with honours at the University of Cape Town. The degree took four years. Describe a typical day on the job I perform diagnostic audiological assessments of various age groups. If they are hearing aid candidates, I provide them with counselling and take earmould impressions for hearing aids. I also see patients for their hearing aid fittings and follow-ups. I am the only person in the department and therefore have administrative duties to fulfil as well. We are currently awaiting our newborn hearing screening machine. Once that comes I will also start running a newborn hearing screening programme. What do you enjoy most about your work? I love working with people. The best thing about my job is doing hearing aid fittings and seeing the patients’ faces light up when they receive their hearing aids. Those first moments when they can hear better than they did before are priceless. That’s when I know I have made an impact on someone’s life and have improved their communication. Is there anything you don’t like? The administration, and the battle to procure goods can also be very challenging sometimes. What hurdles have you had to overcome? Many administrative fights! What’s been the highlight of your career to date? Starting an outreach programme on the West Coast. I love being part of making my services more accessible to our outlying patients. What are your future goals? To continue studying and to obtain my master’s. In your line of work, is experience as important as formal training? Definitely! Experience assists you in being better equipped for both the assessment and the rehabilitation process. Is there a type of personality best suited to this work, or certain traits one should have (or not have)? Yes! Being in this profession, one needs to be able to demonstrate patience – this is vital in order to work with the hearing impaired population. Working with children and the elderly requires one to have a decent sense of humour too! Being a sociable person certainly helps, as patients need to feel that you are trustworthy and approachable. What advice would you give to someone starting out in audiology? If you are passionate about helping people, and enjoy technical work too, then this may be the career for you. Always remember that the patient deserves to be treated with the utmost respect! Patience, patience and more patience. A degree in audiology is required of all individuals who want to become audiologists. A National Senior Certificate that meets the requirements for a degree course is a prerequisite. The graduate programme typically requires four years to complete; applicants must hold a bachelor’s degree to qualify, preferably in a medically-related field. 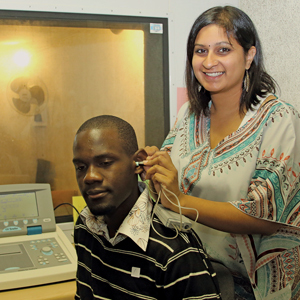 Most audiology programmes include an internship or other clinical practice opportunity.